Tales of a summer with a 91 (now 95!) year old: My newest Kindle eBook is up! My newest Kindle eBook is up! Well, after an incredibly sad day yesterday of mourning the first year anniversary of Mom's death and putting to sleep yet another dog (thanks John - there was no way I could have done it yesterday, and it had to be done), today is dawning brighter. I immediately felt better upon arising from a long sleep, snuggled in with 3 remaining dogs. Oh well - "These things happen." I spent most of the day unpacking from the latest excursion to Dominican Republic while planning the next trip for the month of May. Six loads of clothes later and I'm almost repacked and dreaming of the next trip. I'm certainly making up for the time I was Mom's caregiver and couldn't get away for very long! I know she'd be proud of me. I also managed somehow to get my new Kindle eBook done. 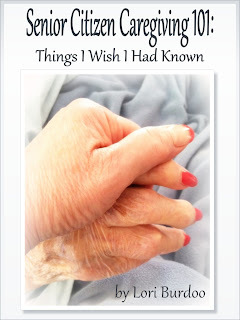 The title is "Senior caregiving 101: Things I wish I had known." There's 15 chapters about stuff I mostly figured out on my own, with a little help from my friends, and a whole lot of guidance from my Mom. It's free from the Kindle lending library so, if you have a Kindle, go for it. It was really cathartic to write and a whole lot of fun to finish! Thanks loads to Sharyn for editing it for me and for John being my second reader. Note: if you do read it, please leave me a comment on Amazon.com. I'd really appreciate the leg up.